At the U.S. Attorney General Confirmation hearings on Jan. 28, Republican U.S. Sen. John Cornyn from Texas asked U.S. Attorney General nominee Loretta Lynch what seemed to be the gnawing question on everybody’s mind. Lynch giggled and declined, rightfully reasserting her independence from current U.S. Attorney General Eric Holder — given the fact that, well, they are two completely different people. However, Cornyn’s litmus test on “Eric Holder-ness” isn’t all that unusual. For one, Holder had a pretty contentious relationship with Congress. Additionally, he carries a relatively controversial legacy, mainly because of his discordant stances: being the first African-American to lead the U.S. Justice Department, stressing the rights of minorities, all while presiding over former U.S. President George W. Bush administration’s infamous surveillance network that threatens the legitimacy of his dedication to civil rights. Holder notably defended the Voting Rights Act in a confrontation with Voter ID laws and steered “away from the drug war and mass incarceration,” often being tough on race-relations in the United States in a way the president was not. Yet, his tacit approval of the National Security Agency spying on Americans by acquiescing to risibly broad definitions of terrorist suspects, his reluctance to prosecute anyone in the CIA torture panel aside from whistleblower John Kiriakou, his similar failure to prosecute the financially risky behavior responsible for the recession and his floppy views on forfeiture have rendered second thoughts. All this is to say Holder’s resignation did not go unexpected. However, whether or not Lynch’s policies will substantially differ from Holder’s is not so clear. She is expected to smoothly succeed Holder as Attorney General, even with slight Republican opposition. Yet, she shares a lot of the same positions as him. On one hand, she actively promises to use federal lawsuits to block Voter ID laws and shares the same “fierce commitment” to civil rights as Holder. On the other hand, Colorado is already sweating at Lynch’s absolute opposition to legalized marijuana. Republicans are already grilling her on her defense of a civilian court system, and Democrats and Republicans alike are skeptical of how well she plans to hold banks accountable for the recession — again, much like Holder. 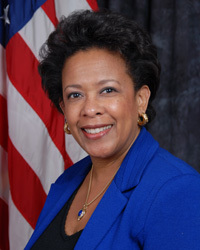 So will Loretta Lynch be another Eric Holder? I suppose we’ll see next week, on America’s Next Top Lawyer.